For patients missing one or more of their natural teeth, dental implants offer a secure, natural-looking, and permanent solution. Unlike fixed bridges or dentures, dental implants most closely mimic real teeth by replacing not only the tooth, but also the root. Often made out of biologically safe titanium, the implant is installed surgically into the jaw. In a process called osseointegration, the root actually fuses with the jawbone, as demonstrated in the diagram shown to the right. Restored dental implants look and function exactly like natural teeth. Studies have shown that implants are actually stronger than your natural teeth and will hold up very well over time. Dental implant prosthetics are artistically created to attach to the surgically implanted posts in your jaw. While Dr. Smigielski does not perform dental implant surgery, he is skilled in the restorative aspect of placing dental implants. Our beautiful, natural-looking implant prosthetics can complement any smile. The Implants are specially designed to match your surrounding teeth. The appropriate color, shape, and size is considered so that your smile looks completely flawless. Losing a tooth can be a serious concern, but the results that can be achieved with this restorative technique leave patients feeling 100% confident with their smile. Surgery: The first step is for the oral surgeon or periodontist to install a titanium post into your jaw. Your jawbone will almost immediately begin to grow around the implant anchoring it into place. After Surgery: For the first few days following surgery, you may be asked not to wear the temporary replacement teeth. However, you will soon be able to wear replacements as you begin to heal. Though they may not be permanent prosthetics, they will look like natural teeth. Prosthetics: Following osseointegration, the final prosthetic will be attached to the titanium implant. The permanent solution will be strong and durable. It is made especially for your smile, so it will look exactly like a real tooth. Once the restorative phase is complete and the final implants are attached, you can treat your implants exactly like your real teeth. Because they fit seamlessly in your mouth, your dental implants will be indistinguishable from your surrounding teeth. No one has to know that you’ve had any work done or that you were ever missing a tooth. If a patient is missing most or all of their teeth, dental implants can be particularly helpful. Implants can be used to help secure a denture. An important advantage of combining dental implants with dentures is that when you have no teeth, your body automatically begins to reabsorb the bone for the minerals to be used elsewhere in the body. In turn, your facial structure shrinks and over time little bone will remain to support the denture. This condition is called facial collapse. At this point, a patient’s denture can slip around or even fall out at embarrassing times. 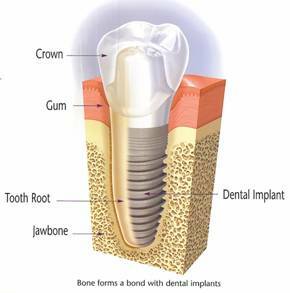 Therefore, dental implants actually stop the bone loss and avoid this condition all together. The denture will be stabilized and there will be no threat of facial collapse.